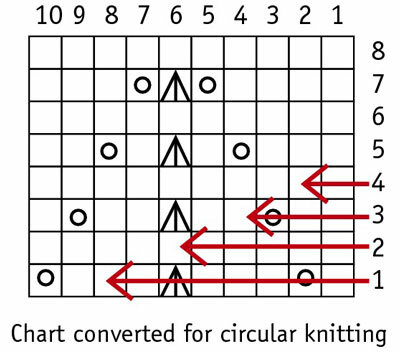 Working charts in circular knitting is somewhat different than working charts in flat knitting. 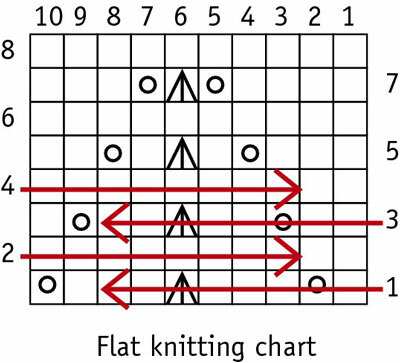 Knowing how to read charts will help enhance your knitting by giving you the flexibility to add drama to your work. Most charts in stitch dictionaries are written for back-and-forth knitting. Each square of the chart represents one finished stitch. You begin in the lower right corner and work row 1 from right to left. Then you work row 2 from left to right, working each subsequent row in the opposite direction from the row before it. The arrows in the following illustration show the direction in which you would work the first few rows. 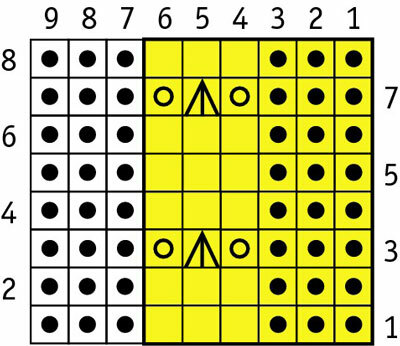 The row numbers are often shown alternately on both sides of the chart, indicating the beginning of each row. The key for this kind of chart often says something like “knit on the RS, purl on the WS.” Directions written this way are a clear indicator for back-and-forth knitting. If a stitch pattern is written only in words, it is more difficult to work it in the round without charting it first. You need to work each wrong-side row backward while at the same time reversing each stitch (with a purl becoming a knit). Also, some techniques that you work on the wrong side are not easy to reverse, such as complex stitch manipulations in cables or lace patterns. First chart out any back-and-forth stitch pattern instructions and work in the round from that. A repeat is a section of a chart that you work multiple times around or across your knitting. 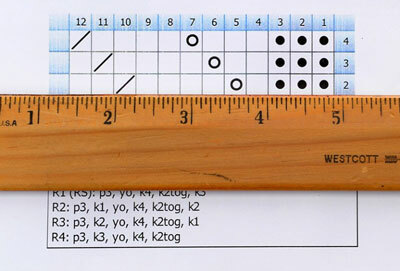 Some charts include partial repeats that you insert to center the pattern on a flat piece of knitting. You may want to remove these extra stitches when working in the round. This chart has a six-stitch repeat (highlighted) with three stitches at the end to balance it. If you used this chart on a project worked flat, you would work the first six stitches repeatedly until you came to the last three stitches, where you would work the partial repeat at the end. However, when using this chart in the round, you would work only the highlighted section around the circumference of the project. You can keep track of where you are on a chart by placing a ruler beneath the line you are currently working. You can also use a highlighter or repositionable highlighter tape to divide the chart into ten-row segments for ease in finding your place, or simply cross out a row when you complete it. It’s a good idea to photocopy your charts for marking on rather than marking directly in books. Photocopies also allow you to enlarge charts that are difficult to see.